With the appearance of turbocharged Formula One cars in the late 1970s, "turbomania" gripped motorsport and spilled over into everyday life, where the word "turbo" was applied to products from aftershave to vacuum cleaners. 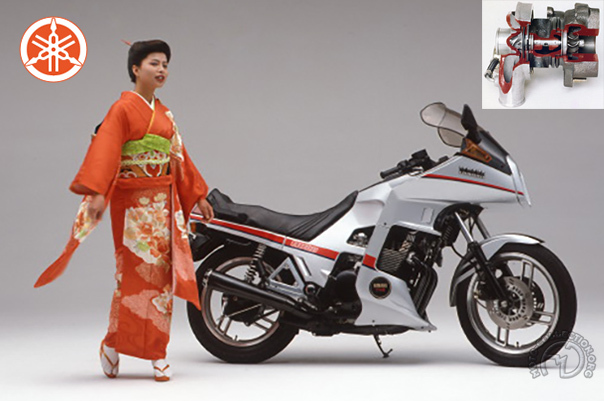 ln the twowheeled world, every major manufacturer added a turbocharged model. Honda led the way; Yamaha was more cautious. If the turbo represented a low-cost way of boosting the performance of an automobile, the weight and bulk of this bolt-on goody and its attendant plumbing made its advantages less obvious on motorbikes, where large-capacity engines were readily available anyway. But at the time Honda and Yamaha were locked in a bitter struggle for supremacy. The latter couldn't let the former outdo it in terms of high-tech features, even though at the period its finances were under considerable strain. mJection. A small-diameter turbocharger minimized throttle Jag. Otherwise, the machine was quite conventional, though its aggressive fairing made it look at least like a fuel-injected 750. However, its performance was little improvement on the normally aspirated version, and sales were low. Despite the simple technology of its 650, Yamaha was beat by Honda when it came to launching the first production bike fitted with a turho.